The breakeven sales, part II: Competition, will tell us if you should follow a competitor on its drop-price move. Here again you need to know somehow your demand function. In the example attached you will find a competitor dropping its price from $ 6.00 to $ 5.00 this is 16.657 %. Now, you have two extreme alternatives. Alternative A is to follow the drop-price move and alternative B is to don’t follow the drop-price move. 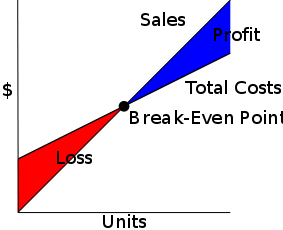 In both alternatives you are expected to lose money, but if you choose alternative B you will lose the same as alternative A only if sales drop 50.25% (equal to 1,990 units). If sales don’t drop that much you will be in a better position than in alternative A. A third alternative will be to follow the competitor but partially. This entry was posted in Marketing and tagged Break-even (economics), Competition, Contribution margin. Bookmark the permalink.